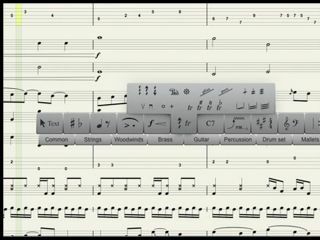 Notion 3 promises to make score creation easy. PRESS RELEASE: NOTION Music, Inc. (www.notionmusic.com) has announced that NOTION3, the much anticipated upgrade of their award winning music notation software, will start shipping on September 24, 2009. NOTION3 features an entirely new design, an expanded and enhanced sample library, new live performance features, and incredible compatibility with plug-ins, sample libraries and digital audio workstations (DAWs). NOTION3 is the first product to bridge the gap between music notation software and an audio application, allowing musicians to not only create and listen, but to perform live or produce music with stunning results. Describing the inspiration for NOTION3, Jim Boitnott, President of NOTION Music credits feedback from their customers, "Numerous customers told us they didn't want just another music notation program. They wanted their notation software to integrate with their DAWs, to be compatible with other sample libraries and plug-ins, and they wanted a clean intuitive interface that supported their workflow. We are proud to say that NOTION3 has definitely delivered." Sleek, Intuitive Interface and Workflow: allowing you to use notation, guitar tab, or MIDI devices to craft music of any style, be it orchestral, jazz, or rock. The screen view is designed to remain uncluttered, and to provide easy access to the most frequently used tools. For musicians writing for guitar or bass, NOTION3 features an interactive fretboard and chord library. Over 10GB of Instrument Samples: exclusively featuring the sounds of The London Symphony Orchestra. The LSO sample library included in earlier versions of NOTION has been expanded and enhanced with new close mic stereo samples that truly capture the essence of each instrument. NOTION3 includes both the legacy and new sample libraries. In addition to the orchestral sounds, NOTION3 features electric and acoustic guitar by Neil Zaza, electric bass by Victor Wooten, drums by Roy "FutureMan" Wooten — all recorded at world-famous studios. Professional Audio Mixer: NOTION3's pro audio mixer is unlike anything typically seen in notation software, complete with buses, inserts, sends, multiple direct channel outs and VST effects. Resembling what you would see in a digital audio workstation, the NOTION3 mixer, along with the dynamic markings in the score, provide detailed control of the mix and sound. You have the flexibility to control and mix your entire score or group the mixer into instrument sections to adjust volume, panning, reverb, and effects. Unmatched Studio Compatibility: Built to be compatible, NOTION3 is the only notation product with full ReWire integration that supports both host and slave options. It also works effortlessly with VST effects and VSTi libraries with built-in presets to easily integrate with popular sample libraries such as: Vienna Symphonic Library Special Edition and Special Edition Plus, Miroslav Philharmonik, East West Quantum Leap Platinum, and Garritan Personal Orchestra (ARIA). NOTION3 comes bundled with IK Multimedia's AmpliTube X-Gear and CSR Hall Reverb. SequencerStaff: a feature unique to NOTION3 that brings the world of notation and sequencers together. This feature enables you to record MIDI input directly onto a standard notation staff while retaining all the MIDI data such as modulations, bends and dynamics. The MIDI data displayed on the staff includes duration, range in pitch, and dynamic information, which can be easily edited. Live Performance with NTempo: NOTION3's suite of live performance features make it possible to "play" a notated score like a musical instrument for accompaniment, rehearsal, or professional live performances. It is the only notation product with real-time tempo control that includes vamps, repeats, and other advanced score navigation features. With the NTempo feature, you can tap the speed of a score to the fraction of note level, providing the kind of rhythmic nuance you hear when playing a traditional musical instrument. NOTION has been used in numerous touring productions worldwide ranging from hit musicals like Annie and The Wizard of Oz to Meatloaf's Bat Out of Hell tour. NOTION3's street price of $199.00 is less than half the price of competitors Finale and Sibelius. NOTION Music is also offering free upgrades to registered users of NOTION 2.0 or earlier. Explaining the bold move, Boitnott says, "We know our customers were the ones that made NOTION3 possible, so we wanted to show our gratitude by giving them a gift that we are very proud of." Registered users of NOTION Music's other products, PROGRESSION, and PROTÉGÉ, as well as competitive notation products like Finale and Sibelius can upgrade to NOTION3 for $99.00.